It is always difficult for me to write a review of new children’s books when I do not feel enthusiastic about the work. I know that someone has put their heart and soul into the work, but I am highly critical of what I read to my children. Often, I feel the intent and message behind the book(s) is good, but this is lost amongst characters and plots that confuse and distract. The Principle Gang is a new series of books written by health practitioners. The books address bullying and values for children ages 4 to 11. The NEA reports that 160,000 students stay home from school everyday due to bullying. While anti-bullying laws are growing at state and local levels, making schools take action for adverse events occurring on campus, parents and clinicians are often better able to recognize the signs of a child being bullied—and can help put a stop to it. The issue of bullying weighs heavily on the minds of Dan and Bli Dugi, a physician and physician assistant. While building their young daughter’s home-based library, they saw a need for books that expressed values in a vibrant way. The Dugis created The Principle Gang series, a collection of six books that brings to life the timeless messages parents have been conveying to their children for centuries—messages about family, friendship, community and fairness. The first book in the series, Don’t Judge a Lizard by His Scales, releases in August and book two, Wizard Lizard Rides the Subway, debuts in October. Children are invited to become a member of “The Principle Gang,” by taking an oath to promise respect and encouragement, while learning important principles to make a difference. The characters in the series have different strengths and weaknesses that children can relate to. We were sent the first two books in the series to review. The books will be released in October. I agree bullying is a big problem in schools and our larger society. As a teacher, I have seen it occur on many levels. 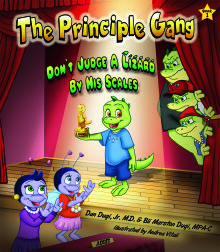 I do like how in the first book ([amazon_link id=”0989836207″ target=”_blank” ]Don’t Judge a Lizard by His Scales: Book One in The Principle Gang series[/amazon_link]), the mother also learns from the experience. Too often, I see parents also practice bullying at school both with their own children and the staff. I love using children’s literature to discuss values and social issues. I still remember fondly the [amazon_link id=”0916392074″ target=”_blank” ]Value Tales[/amazon_link] book series from my youth that featured historical figures and highlighted their strengths. I read them multiple times. Unfortunately, I am not enamored similarly with the Principle Gang. I feel the message gets lost in a plot that is trying to be modern and cute and loses the message. I also dislike how the Lizard character has to give up eating flies to become friends with Bli the Fly. It just doesn’t make sense. There are questions at the back of each book to inspire discussion. These books are part of Tree Neutral program that offsets trees used to produce the book by planting new ones.